GLAND, Switzerland, June 7, 2011 (ENS) – One of the planet’s largest species of bird is on the edge of extinction, according to the 2011 IUCN Red List of Threatened Species for Birds, released today by BirdLife International, an IUCN Red List partner. 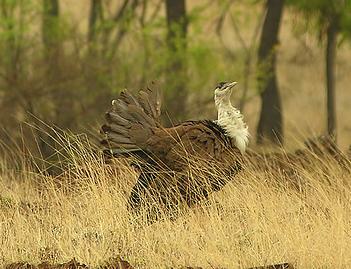 The Great Indian Bustard, Ardeotis nigriceps, has been uplisted to Critically Endangered, the highest level of threat. Hunting, disturbance, habitat loss and fragmentation have reduced this species to as few as 250 individuals. Standing a meter (39 inches) in height and weighing in at nearly 15 kg (33 pounds), the Great Indian Bustard was once widespread across the grasslands of India and Pakistan but is now restricted to small and isolated fragments of habitat. “In an ever more crowded world, species that need lots of space, such as the Great Indian Bustard, are losing out. However, we are the ones who lose in the long run, as the services that nature provides us start to disappear,” said Dr. Leon Bennun, BirdLife’s director of science and policy. This year’s update brings the total number of threatened bird species to 1,253, or 13 percent of the world’s total number of bird species. “In the space of a year, another 13 bird species have moved into the threatened categories,” said Jean-Christophe Vié, deputy director, IUCN Global Species Programme. “Birds provide a window on the rest of nature. They are very useful indicators of ecosystem health. If they are faring badly, then so is wildlife more generally,” said Dr. Stuart Butchart, BirdLife’s Global Research and Indicators coordinator. “The changes we have documented in this year’s update will feed into the Red List Index for birds, a measure of trends in the state of the planet used by the world governments, global businesses and the United Nations, among others,” said Butchart. Another species on the brink is the Bahama Oriole, Icterus northropi, also newly listed as Critically Endangered. Recent survey work suggests the population of this black and yellow Caribbean bird could be as low as 180 individuals. These orioles live in mature woodland, and nest in coconut palms. Lethal yellowing disease of these palms has wiped out nesting trees in areas where the Bahama oriole was previously common but is now absent. The oriole is also threatened by the recent arrival of the shiny cowbird, Molothrus bonariensis, a brood parasite that lays its eggs in other species’ nests. Yet in just two years, the latest assessment now classes the Secretarybird as Vulnerable to extinction. “Although the situation appears bleak for many species, this year’s update does highlight several species where targeted conservation work has turned around their fortunes,” said Andy Symes, BirdLife’s Global Species Programme officer. The Campbell Island teal, Anas nesiotis, has benefitted from a massive programme to eradicate rats, plus captive breeding of remaining individuals. The species has now returned to New Zealand’s Campbell Island and the majority of birds are now thriving, resulting in a reclassification of the threat status to Endangered. Americas Pale-headed Brush-finch, Atlapetes pallidiceps,, has been downlisted from Critically Endangered to Endangered. Black-backed Thornbill, Ramphomicron dorsale, has been uplisted from Least Concertn to Endangered. 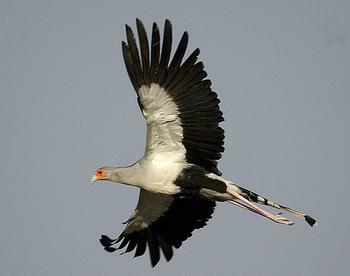 Africa Secretarybird, Sagittarius serpentarius, has been uplisted from Least Concern to Vulnerable. Hooded Vulture, Necrosyrtes monachus, has been uplisted from Least Concern to Endangered. Europe and the Middle East Lesser Kestrel, Falco naumanni, has been downlisted from Vulnerable to Least Concern Socotra Buzzard, Buteo socotraensis, is newly described and has been listed as Vulnerable.